← Say It! Say It! Say It! In homage to those like Keats, Wordsworth and Shelley (and because my kids are all out of my house and off to the first day of school and I’m kind of bored and putting off my workout and other various and sundry chores), I have decided to write a poem. How my soul thunders at your sweet smells and irradiated hours. Why, thou art bursting with vivid comestibles and waterlogged reverie! The waning of your days is forever married with my ebbing enthuse. What splendor dreamt by deities in sculpting your essence. Well, that didn’t take nearly long enough, despite the constant thesaurus look-ups. Maybe I’ll go a little less formal with a haiku. Summer is wet, bright and free. Must be the freshly mowed grass. Where’s the ice cream man? Kid A = 11th grade, Kid B = 8th grade, Kid C = 6th grade, Kid D = 2nd grade, and Kid E = Georgia pre-K. Mom = sad that summer is over. I am always bummed that summer is essentially over for us when school starts, even though it is still August. But I can say that I am happy to get back to writing more regularly. And I know that the kids could certainly use some time apart from each other. Just the other day, I listened from my office as I heard Kid E driving his siblings absolutely batty. He went from one to the next, just nudging and annoying them with his, “Play with me” and “Get this for me” and “Will someone wipe me?” Finally I heard that he was left alone in the upstairs hallway, as everyone else had retreated to their rooms for some much-needed alone time. Never to be discouraged, Kid E knocked on someone’s bedroom door. Whatever. It got them to open the door. Happy First Day of School, my southern peeps. And to those of you that still get to go to the beaches and the pools and sleep in for a few weeks longer, I hope you appreciate how good you’ve got it. Enjoy your vivid comestibles and waterlogged reverie. This entry was posted in family, Fun Mommy, kids, parenting, pre-school, school, writing and tagged chevron, first day of school, haiku is 5-7-5, I love Summer, my thesaurus got a workout today, odes are kind of pretentious, poems. Bookmark the permalink. Was the picture taken on the first school day? BEAUTIFUL!! I can never get M to wear a dress to schoo:( So happy to see you last Wednesday. M&C were excited to be able to see and play with Molly – thank you for making that exception for them. Yes, M&C still sleep in and we are headed to beach this Saturday – move here?! That picture was taken on the first day of school. All of the stars aligned and I got all of my kids to stand still and smile. When does that EVER happen? It was wonderful to see you all last week too. I’m glad that we could make it happen. And Holy cripes! 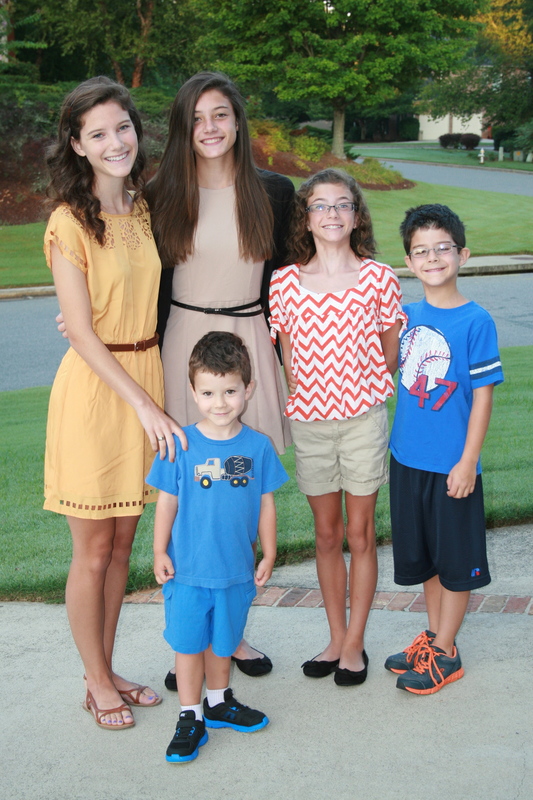 We could never afford to raise five kids in Fairfax Station. You’re as crazy as ever. I hope you realize how much I enjoy your blog!